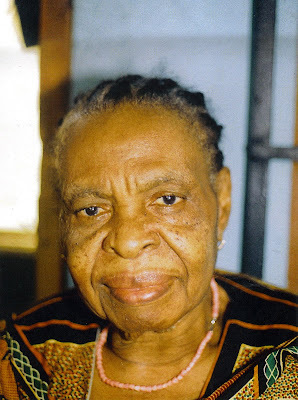 Ada Igbo, Igiriri Ututu, Ezigbo Nnem, Osodi ama mba. ate on August 13th, 2010 and wiped her mouth. but it has not eaten you. It cannot eat you. It never can. for more than two years, like Job, you never blasphemed. Let me not think about this. for if heaven indeed does exist, you are already there, no doubt. oh what a privilege it will be, to be your son again, be your song again. Away from our discomforted sleeps, you in Boston, I in london, we walk in dream through places we have been before. Each time our eyes meet, I look away in shame. I look away in shame not because I have been a bad son, but because I could have been a better son. We pause to talk outside the now empty plot across the road from Chief Onyeado’s house where your little restaurant once stood. The flatness of that plot makes a loud sound like a judge’s gavel, as if it judges me and accuses me of something. You squeeze my hand tenderly, comfortingly, and I look into your eyes, distant yet happy, wanting yet fulfilled, and they say to me that whether or not I know it, given my peculiar circumstances in life, that you know that I have been as best a son as I could have been, that if I could have been better, I would most definitely have been. Then we walk on towards Nkwonta. In silence. I don’t exactly buy the way you forgive my failings. I wonder if I had been less a coward at times, if I had been more of a risk taker at times, if I had done this, or if I had done that, if I had not returned to Nigeria from England in 1987, If I had not gone to Kaduna in 1991, if I had not gone back to England in 1997, if I had not remained in England since then… suddenly you remind me that the lights have not yet gone out in your house. You are 80 years old today, mama. We, all your children have marked it in our individual homes with prayers and channeling of love to you. Not quite the party we all had in mind. If it is the will of God, we shall still hold that party to celebrate your life, and it has been quite a life. In the forty years I have been your son, I have never known anyone more loving, more caring or more generous than you. In the forty years I have been your son, I have never known anyone more forgiving, more peace-loving or more willing to submit to the will of the most high. Through the many great moments of wonderful things that happened in our family and through the most tragic time in our family’s history September 1982 - December 1982; a four-month period in which you lost your husband Stephen in September, your son Chidi in October and your mother Agnes in December, you could only say, “God will give me the grace not to blaspheme.” I remember the way you have lived your life, the way you have raised me to put all my trust in God, and these are the things that make it posssible for me to keep it all together at a time like this. I love you Ada Igbo. If there were words capable of expressing the way I feel I would use them here, there are no such words. May the peace of God be with you every minute of every day. May God send his ministering angels to you every minute of every day with the thoughts and prayers from all your children, grandchildren, great grandchildren and other family members and well wishers. Today, I spoke to your old friend, Helen Leach, and could not believe my ears when she said she is starting a new course in Literature at University in May this year. Mama, Helen is going to be 81 years old in October. Won’t it be just mindblowing if you shocked us with a social or literary adventure like Helen’s sometime soon? She wishes you a very happy birthday. Going through the Igirigi Ututu files on my computer, I found the letter above which I wrote to my mother on her 80th birthday, 24th March, 2008. I never posted the letter to her, but read it into the ears of God as I prayed for her that day. I believed that God's ministering angels would deliver the message directly to her heart. I have left the letter as it was. Now I release it into the web, hoping that now she has passed away, she might have some kind of spiritual Internet where she can browse through and read this letter.